Sharon Kleyne, Founder of Bio Logic Aqua Research, has now revealed the absolute truth for beautiful skin. After researching the secret for three decades, she discovered Bio-Logic Aqua® - a rare, all-natural tissue culture water - the pure, pH correct, trade secret water in Nature's Mist® Face of the Water®. Winter is the season for dry skin, reports noted water and health researcher Sharon Kleyne. In winter, says Kleyne, skin tends to lose water and become dehydrated, thin, itchy, pale, more wrinkled and often flaky. Kleyne recently identified several causes of winter dry skin: Cold air holds less water vapor than warm air, skin receives less sunshine and therefore makes less vitamin D, people spend more time indoors, and winter inversion layers increase the air's pollution. The good news, according to Kleyne, is that dry, dehydrated winter skin is avoidable. Sharon Kleyne hosts the globally syndicated Sharon Kleyne Hour Power of Water® radio show on VoiceAmerica and Apple iTunes. Kleyne is Founder of Bio-Logic Aqua Research, a fresh water and health research, education and product development center. The Research Center's global product, Nature's Mist® Face of the Water® provides a humidifying mist that instantly supplements lost skin water. The cooler the air temperature, Kleyne notes, the less atmospheric water vapor, also called "humidity," the air is capable of holding. When humidity decreases, the pressure on nearby liquid water to evaporate into the air, increases, including the water in human skin. When the skin's water content evaporates, the skin becomes dry. Wind, especially cold wind, increases evaporative pressure. According to Kleyne, wind blows away the thin layer of warm, moist air that forms at the surface of the skin, face and eyelids. That's why windy air feels colder than calm air. Skin receives less direct sun exposure in winter, according to Kleyne, because people cover up more and spend less time outside. This can affect the amount of vitamin D produced in their skin, which is stimulated by sunshine. Vitamin D plays a role in skin health but so do vitamins A, C and E. Most people in the United States ingest vitamin D as a food additive. Reduced vitamin D synthesis could be a factor for individuals who eat a 100% natural diet (See http://www.nutritionjrnl.com/article/S0899-9007(01)00660-8/abstract). Kleyne does not advocate vitamin supplements. Skin is also dryer in winter, according to Kleyne, because more time is spent indoors, in rooms with insulated walls and windows and forced-air heating and cooling. Re-circulated forced air can lower humidity and increase airborne bacteria. Humidity, wind and airborne bacteria are all dehydrators. Air pollution particles, Kleyne notes, not only dehydrate skin on contact, they also tend to lower the air's humidity, increasing the dehydrating effect. Pollution is worse in winter because winter is the season for morning "inversion layers," where colder air moves in at night and traps the warmer, polluted air underneath, preventing it from dissipating. To maintain skin hydration in winter, Kleyne recommends eight glasses of warm water a day, in addition to other fluid intake. Kleyne also recommends keeping a couple windows slightly opened - especially in the bathroom - to let in fresh air. Other suggestions: House plants and bowls of water will raise a room's humidity, and placing baffles over forced-air vents will prevent them from blowing directly onto the face. Frequent baths are also beneficial. Regarding winter skin care. Kleyne notes that commercial lotions labeled as "moisturizers," do not actually increase the skin's water content. Their purpose is to act as a barrier that seals in existing skin moisture. These products, says Kleyne, are only effective if the skin contains sufficient moisture before they are applied. 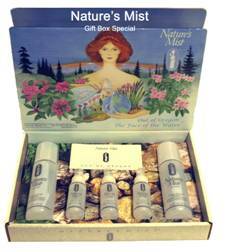 According to Kleyne, her company's Nature's Mist® Face of the Water ® product is specifically designed to supplement skin moisture lost as a result of winter conditions. For the extra sensitive facial skin, Kleyne recommends a morning ritual of facial misting followed by repeated cleansing with a warm, wet washcloth and mild liquid soap. This should be followed by a second mist application, followed by a moisture sealing lotion or make-up base. Finally, Kleyne observes that the "Breath of Life," the natural life sustaining components of our environment, tend to be less comfortable and more difficult to obtain in winter. She believes it is more important than ever in winter to go out of one's way to maintain health and prevent illness.